Garlic, a species of onion, has been eaten by humans for centuries. It has been used by ancient cultures for religious and spiritual reasons. It has been a key ingredient for delicious dishes and meals around the world. And, of course, it’s used for its medicinal properties! But can eating garlic regularly really have any long-term health effects? Or is that all nonsense with no scientific backing? As it turns out, there are more positive benefits of garlic than you may know about! That’s why eating a hefty serving or two of garlic daily could be good for you in the long run. Here’s how science explains what happens to your body when you eat garlic every day. 1. You develop stronger immunity. Garlic is packed with antioxidants, allowing it to strengthen your immunity and reduce the chances of catching a cold or developing the flu. They’re known to fend off viruses and are especially useful over the winter thanks to their high amino acid, vitamin, and good oil content. Garlic also has an organic component known as allicin which can kill off fungi and bacteria alike. Studies have found that garlic can greatly lessen the chances of catching a cold, and taking a garlic supplement can reduce cold symptoms by 70% compared to placebo pills. So when you eat garlic every day, you may enjoy these same benefits. To enjoy these benefits, try taking between 2 and 3 cloves of garlic daily. You can also have some garlic tea, soups, broths, or stews, according to Nutrihealth founder Health and Wellness Expert Dr. Shikha Sharma. Do note that garlic must be fresh in order for you to enjoy its positive results. 2. You may have stronger bones and teeth. Garlic is known for being good for the teeth and bones. It’s actually fairly great for the mouth all around, as it can heal inflammation and kill off bad microbes. Its antibacterial content makes it fantastic for preventing the development of cavities, so you won’t suffer from toothaches as often. What about for bones, though? It is worth noting that studies have not been conducted on humans regarding the effects of garlic on bones. However, research done with rodents has found that in female rodents, regular garlic supplementation can boost estrogen, which minimizes the risks of losing bone. To tie in with that, a human study found that consuming garlic extract can reduce estrogen deficiency for menopausal women. This means that the positive benefits rodents enjoy from garlic might translate to humans, as many things often do. There is some research to suggest that garlic could be good for those with osteoarthritis, but more study is needed. 3. You develop better heart health. Garlic is able to do wonders for cholesterol levels, especially for LDL cholesterol – which is the negative kind of cholesterol. Meanwhile, HDL (the supposedly more positive cholesterol) remains less affected, so you don’t need to worry about losing good HDL. This happens because of allicin, which is the antioxidant compound that is present in garlic. It helps to bring LDL down while regulating blood sugar. Garlic can reduce LDL levels by up to 15%, which is a positive step for anyone looking to improve heart health. Since allicin works best uncooked and often loses some of that medicinal value it carries when cooked, try consuming raw or half-cooked garlic for best results. If you can’t stomach that, though, don’t worry. You can still keep your positive thinking going! Eating cooked garlic daily will still give you some benefits – just at a lower intensity. 4. Your blood pressure lowers. High blood pressure, known also as hypertension, is one of the biggest causes behind some of the most commonly fatal medical conditions in the world. This includes strokes and heart attacks. Studies have found that garlic works wonders in keeping down the blood pressure, and the impact is pretty significant. In fact, one particular piece of research found that consuming aged garlic extract in between 600 and 1,500 mg doses daily can provide the same benefits as medicinal drug Atenolol. That’s a great reason to eat garlic every day! This works because garlic can widen blood vessels, which leads to lower levels of pressure in the arteries. As a side effect, you may even experience fewer headaches from this! Do note, though, that you will have to eat a good amount of garlic in order to see these results – the equivalent of 4 cloves. 5. Your athletic performance may improve. For centuries, garlic has been used to enhance athletic performance. It was a staple for Olympic athletes when they competed in ancient Greece, and it has been used in many cultures to boost physical work ability and hold off fatigue. Because garlic is so good at keeping your heart healthy, it makes the heart work better overall. What happens to your body is the muscles also begin to work at more efficient and effective paces. Some human tests have shown that garlic oil consumption can reduce peak heart rate by 12% and also provide better fitness for exercise. However, there aren’t many human studies conducted on garlic’s fitness benefits. As such, more research is needed before we jump to full conclusions. Still, the vegetable has shown positive results when taken by those seeking to reduce fatigue and tiredness from exercise. It may also make someone more productive at work as a result, as less tiredness means more concentration and better positive thinking. 6. Your brain function will be stronger. The brain tires and becomes less efficient as we age. Based on the Free Radical theory of aging, this happens due to a reaction that causes chemical oxidation. Essentially, it occurs because humans eat all kinds of food and take in oxygen in order to produce energy for the body to run. This means that the cells are slowly destroyed over time, leading to duller brain function, sagging skin, and plenty of other downsides. That’s why antioxidants are so favored in the health world. Garlic is full of antioxidants, so it fights the body’s natural oxidative damage caused by its processes. It highly reduces oxidative stress when taken in high doses, especially in those who experience conditions like high blood pressure. It does so by producing increased numbers of enzymes with antioxidant properties in the body. This is why garlic is thought to have positive effects on the elderly, too. It may help the brain stay sharp, preventing Alzheimer’s disease, dementia, and other similar conditions. This means it’s also good for memory, concentration, and productivity! 7. You’ll have better skin. Linking back to the Free Radical aging theory, garlic is able to slow the aging of skin and hair. Skin loses collagen over time, causing a lack of elasticity, which is why older skin may sag. Eating just two cloves every day can boost collagen production naturally, as well as elastic production. This is because the skin’s fibroblasts, which are essentially the cells that handle skin renewal, react so well to garlic. In addition, applying garlic onto the skin can protect the skin wonderfully while also helping to treat certain skin conditions, such as eczema, and fungal infections, such as ringworms or athlete’s foot. Of course, this isn’t about eating garlic – but we thought we’d mention it regardless. Some also state that garlic has properties that make it a natural way to protect from the harmful sun’s rays that can age you. Eating more garlic can prevent the sun from excessively drying and photo-aging the skin. Do note that garlic isn’t a substitute for sunscreen! 8. 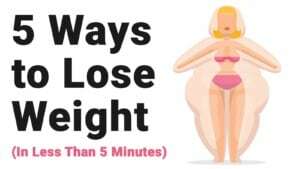 You may lose weight (or have a healthier diet). There are plenty of reasons that garlic may help someone lose weight. The most obvious is the fact that it is such a good ingredient for adding flavor to dishes, and that it contains so many nutrients, all while staying low in calories. One ounce, or 28 grams, of garlic, has only 42 calories. 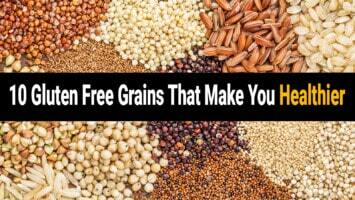 Additionally, it has good levels of vitamin B1, calcium, copper, iron, phosphorus, and potassium. On top of that, garlic has something called ajoene. This component is crucial in the activation of ferments within the body’s blood. These ferments break down and get rid of fatty deposits, helping to break down unnecessary fat. Garlic can also help to burn off extra calories that come with improper food intake. If you’re worried you’re eating too much food, you can eat garlic to counteract it. Do keep in mind, though, that there is a high dose of garlic needed for this to happen! 9. You may live longer and be at lower risk of developing cancer. It’s difficult to effectively prove, without a shadow of a doubt, that any one thing can improve one’s lifespan. However, garlic comes pretty close to being that well-proven. 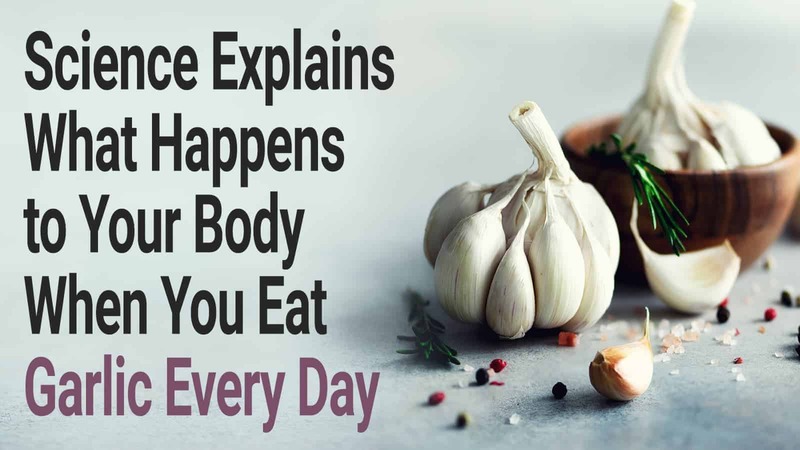 Given its huge number of positive effects and how it can reduce conditions that increase the risk of fatal illness, it’s not surprising that many believe garlic can help them live a longer, healthier life. Garlic can battle diseases and infections. 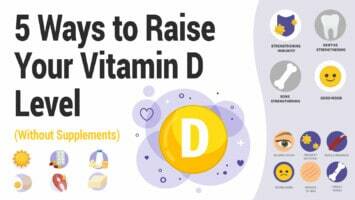 It can keep the brain sharp and functioning well. It’s a good component to add to a diet and it’s highly nutritious. It’s no surprise that garlic might just be that one secret ingredient to longevity! On top of that, there is some evidence that suggests garlic consumption can lower the risk of developing some types of cancer, especially colorectal cancer and stomach cancer. Whether this is due to the boosted immunity the body enjoys, or for some other yet to be studied reason, we aren’t sure. But the potential benefits of eating garlic every day certainly make it worth a shot! Garlic is delicious and nutritious. 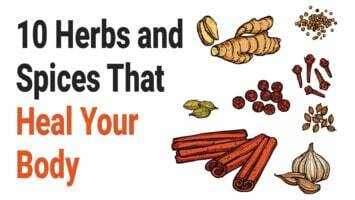 It has countless health-related benefits. With all it can do, adding garlic to your daily meal plan may just turn your life around! Do remember, of course, that garlic is not a suitable substitute for a doctor’s advice and should not be used as a sole treatment for any one condition. If you plan to take a garlic supplement of any kind, speak to a medical professional for advice first!